Nash Ensemble and Stephanie d'Oustrac in an all-French programme from Wigmore Hall, including songs by Duparc, viola music by Vierne, and Ravel's String Quartet. 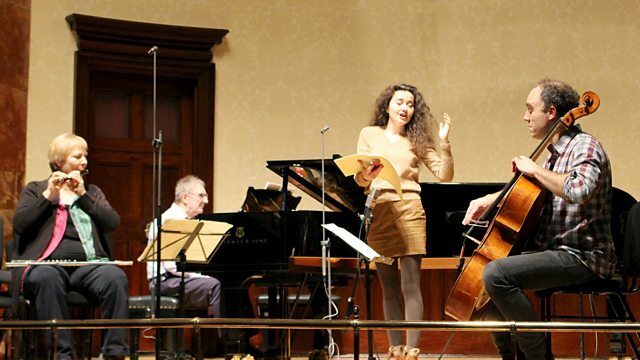 Nash Ensemble and mezzo-soprano Stéphanie d'Oustrac in an all-French programme from Wigmore Hall. The programme includes songs by Duparc and an arrangement of Debussy's elusive Mallarmé cycle, viola music by Vierne and Debussy, and ends with two glorious works by Ravel. Music Arranger: Benno Sachs. Ensemble: Nash Ensemble. Conductor: Ian Brown. Performer: Lawrence Power. Performer: Ian Brown. Performer: Ian Brown. Singer: Stéphanie d'Oustrac. Music Arranger: Colin Matthews. Singer: Stéphanie d'Oustrac. Ensemble: Nash Ensemble. Orchestra: BBC Symphony Orchestra. Conductor: Antal Doráti. Singer: Stéphanie d'Oustrac. Ensemble: Nash Ensemble. Singer: Ariunbaatar Ganbaatar. Orchestra: BBC National Orchestra of Wales. Conductor: Tomáš Hanus.